Success with the electric chainsaw sharpener! At watervole's suggestion, you should now be able to read entries from my http://www.holdenconcertinas.com/ blog on your LJ friends' page by subscribing to holdenconcas. I'm willing to take commissions to make custom-designed jig dolls. Email me (alex at alexholden dot net) if interested. A couple of years ago a client commissioned me to carve some wooden puppets for a Punch and Judy show. Not the two stars of the show: understandably, as I had no prior experience at puppet making, he had those made by a top Punch and Judy puppet maker with many years of experience, and he let me loose on several of the 'extra' characters. Also I was only to do the wood carving, not the painting or costuming. I found this lack of control rather nerve-wracking, particularly the painting part, because a botched paint job can ruin even the best carving work. Something that made the task much trickier for me was that the pro was making his two puppets in parallel to mine so I didn't get to see them until it was too late to modify mine to match the scale or style of his puppets. Luckily the scale worked out fine, and the style is probably near enough that most people wouldn't notice the difference. I forged a carving chisel today: a small grounding chisel. These chisels made by Ashley Iles were my inspiration, but for the work I'm doing I thought it would be better to have a flat edge with a slight skew. They are used for flattening the bottom of a shallow cavity for relief carving or inlay work. I need a couple of really narrow ones for inlaying the twiddly sheet metal decorations on my new concertina ends. You use a scalpel to make a stop cut around the edge of the cavity, then use the grounding chisel to carve out the waste between the stop cuts. My plan had been to make a 3mm wide one first, then try to do a 1.5mm one. Turns out it is extremely difficult to forge tiny tools. I have been convinced that they are probably too warped to use as they are. Particularly as they have warped in two planes in opposite directions. They are glued together with hide glue, so in the worst case I should be able to soak them apart and try again. I have a few theories as to what went wrong. My main one is that the wood got very wet and expanded during the gluing process, then the glue set so the layers could no longer move relative to each other, then the layers continued to dry and shrink over the next several weeks at different rates in two different directions (because alternate layers are laid at 90 degrees to each other for strength), setting up internal stresses in the boards that could only be relieved by taking on a curved shape. Before taking the fairly drastic step of dismantling the boards, I want to try de-stressing and flattening them. For this to work I think I will have to re-activate the glue by applying gentle moisture and heat, and then clamp them flat in a press until they are fully dry, without getting the wood so wet in the process that it builds up internal stresses and warps again. I'm still pondering the best way achieve this. 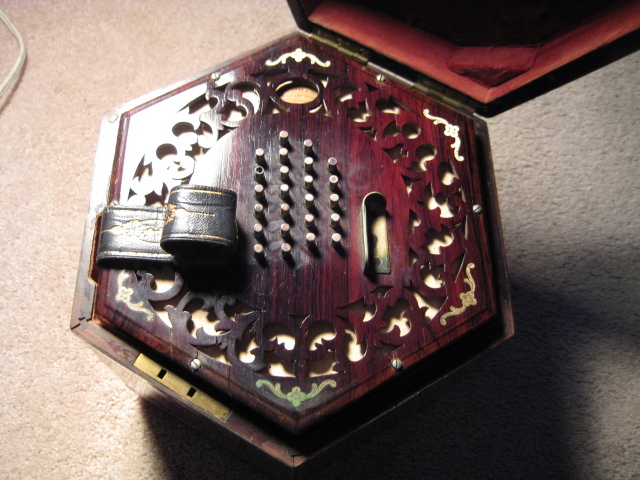 Concertinas have two reeds controlled by each key (button); one that sounds when you are pushing the bellows closed and one that sounds when you are pulling them open. Each reed has a one-way valve associated with it so that air doesn't flow 'backwards' through the reed. The valves are simply flaps of thin leather covering slots in the reed board. If a valve is missing or not sealing properly, at best you waste air and at worst the reed can make some very weird sounds. There are 96 valves in a concertina like mine. Time spent replacing the valves: about 8 hours over several evenings. The thing that opens and closes to control the flow of air when you press and release a key is called a pad, not a valve. On English concertinas the two reeds associated with each key produce the same note, so if you hold a button down and continuously push and pull the bellows you get a bagpipe-like drone (with a slight hiccup each time you change direction). 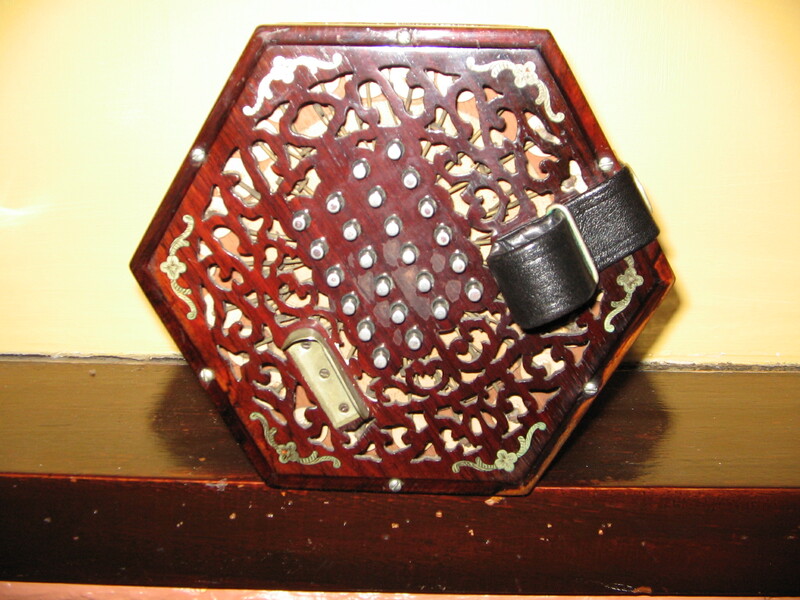 Other types of concertina play different notes on push and pull. Carefully laying them out on a marked sheet of cardboard to make sure they all went back in their original positions. I find myself unexpectedly in need of a Linux-based VPS. Any recommendations? Don't need vast amounts of CPU, RAM or bandwidth, but would like it to be reliable, have access to decent tech support, and don't want to pay over the odds for additional disk space. I'm fairly easy about the distro. Budget is £20/month or less.